On Monday our nation will observe Memorial Day. Its barbeques and beach parties belie the day’s somber theme. Like the Shavuot that precedes it its meaning and import is forgotten. Memorial Day is a day intended to remember and mourn those who were killed while serving our country, those who died defending the land we call home. Among the many thousands I urge you to take these names into your hearts. These are the names of the 50 American Jewish casualties of our wars since 9-11 and although these names are no more precious than the thousands of others casualties they hold a special place in our hearts as American Jews. In addition I commend this article about the Normandy Kaddish Project. 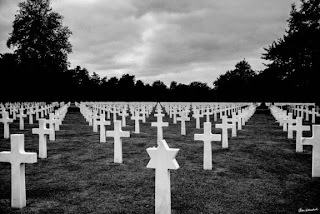 My cousin and fellow Long Islander Alan Weinschel has made it his mission to photograph the 149 Jewish gravestones on Normandy Beach. He has called us to remember these names on the Shabbat closest to the anniversary of D-Day. May the many sacrifices we recall on this Memorial Day strengthen our commitment to American ideals.